Backcountry ski tours in the Asahi Dake area and the Tokachi Mountains. Asahi Dake & The Tokachi Mts. are the heart and soul of backcountry powder skiing in central Hokkaido. Here you will find the most consistent and lightest snow on the planet. We have been guiding and skiing in this area since 1984. 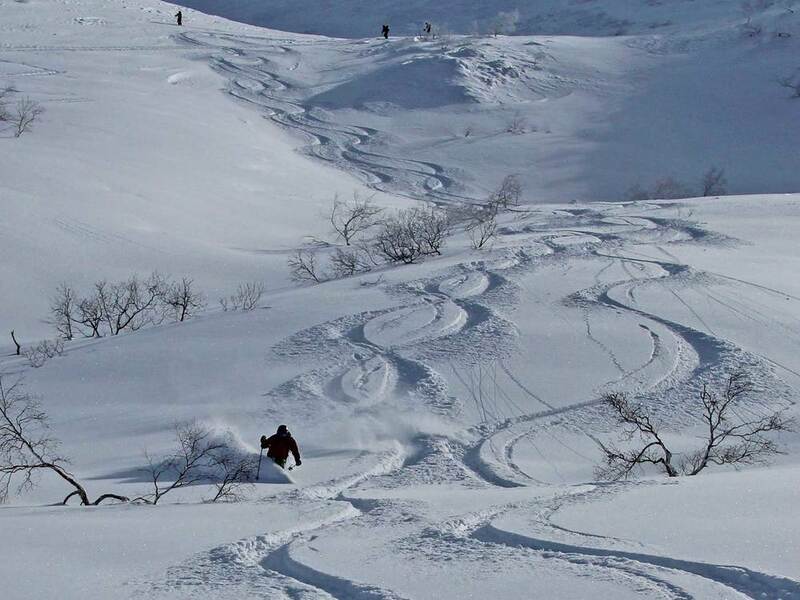 Tokachi is pure backcountry, where you earn your turns in the traditional way. Each area is volcanic meaning you can enjoy natural hot spring baths or “Onsens” at our Inns. Includes: Experienced and qualified ski guide throughout; transfer to and from Asahikawa 5 nights accommodation Japanese style; couples given private room; (single option not available); 5 dinners & 5 breakfasts. Includes: Experienced and qualified ski guide throughout; transfer to & from Furano or Asahi Dake & back to either Asahikawa or Chitose airports. 5 nights accommodation (single option on application); 5 dinners & 5 breakfasts. Not included: All items of a personal nature; skis and ski gear (10% discount hire available); travel insurance (compulsory).